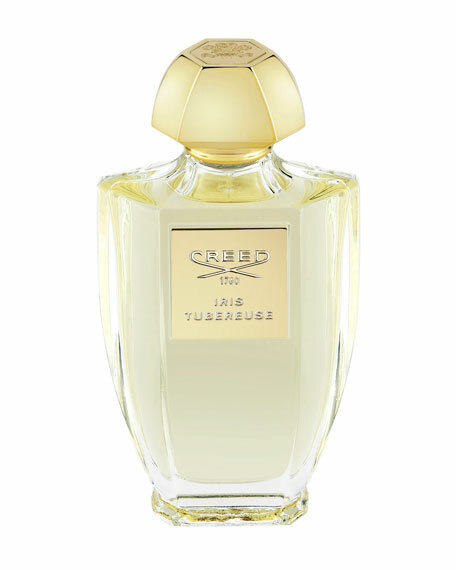 Iris Tubereuse is a shimmering white floral that combines the romance of Tuscany and the sultry allure of India. Fresh galbanum, tender green violet leaf and orange open the scent. Indian tuberose, the finest in the world collected by moonlight, follows with ylang ylang and lily of the valley to create an elegant bouquet. Sicilian orange blossom, musk and Mexican vanilla orchid create the sultry dry-down. A marriage of two of Olivier's favorite places in one refined juice, Iris Tubereuse brings complexity and harmonious balance wherever the wind takes it. Part of the Acqua Originale Collection, Iris Tubereuse is housed in a charming bottle that evokes the broad wings of a transient birda symbol of discovery. The bottle was designed in partnership with Pochet de Courval, the nearly 400-year-old luxury glass bottle maker outside of Paris and House of Creed long-time collaborator, and created with their signature hand-blown glass process. Perfect for the fragrance devotee who admires unique natural essences with fine craftsmanship at its core. For in-store inquiries, use sku #273282.